Heavy rain overnight, which continued as we drove up the A470, suggested that we were to get a thorough soaking and trudge through mud for much of the walk. How wrong we were, the rain was light as we left the cars in the Taff Bargoed Park and soon stopped completely. We followed a solid path north along a full Bargoed River. Geese, ducks and swans were enjoying the water. An attractive insect hotel had been built on the side of the path. On the edge of the river were fishing platforms which we didn’t step onto as we could imagine sliding across the slimy wet surface straight into the river. 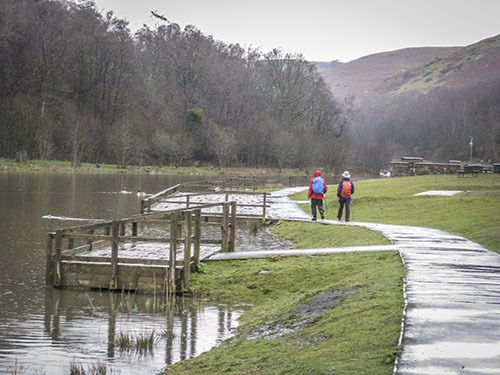 Wild fishing was established here in 2012 by the Environment Agency Wales (partly funded by the European regional development fund). In 1994 mine water containing iron salts flowed from two of the disused mineshafts of local mines via a culvert into the river, staining it orange for many kilometres. Reed beds using more than 100,000 individual reeds were planted, creating one of the largest reed beds in Europe. The effect is amazing we could see bright orange water replaced by clear flowing streams. The reed beds while forming a natural filtration system provide habitat for mammals, birds, amphibians, insects and invertebrates. Continuing north we reached the Bargoed Rock climbing centre. Soon we left the river and turned west across moorland. We contoured around a hill and headed south. Just after Pen-heol-Adam farm was a solar farm and we decided to stop for lunch as the views were good and a comfortable bank beckoned. A tar macadam track took us through the centre of the vast solar farm and we noticed little hatches in the strong metal fencing for letting small animals through, though there was evidence that they just burrowed under it wherever they wished. On reaching Hendai farm we headed across farmland, towards LLancaiach Fawr, and encountered our first real mud of the day (the stuff that clings to your boots and makes them heavy). 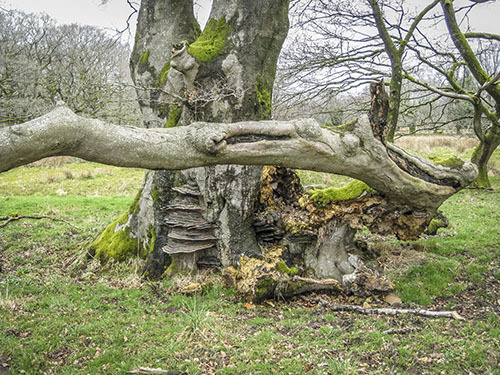 An amazing tree had a strange shape and a ladder of fungus grew on its trunk. Crossing the road at Llancaiach Fawr we headed to Llancaiach village and re-entered the Taff Bargoed Park following the coal seams which we had seen a couple of months ago. We set off from Wenvoe on a misty morning and were pleased that it brightened up as we drove north of the M4 towards Abergavenny. Parking near the tramway at Govilon, we started out in sunshine and soon passed Govilon station, now a private house but decorated with railway memorabilia – including London Midland and Scottish railway company signage, dated August 1924, promising a forty shilling penalty for trespass. Soon we moved onto farmland heading generally south. The fields were full of ewes with their lambs and overhead we spotted two buzzards and a kite. Climbing steadily towards the Blorenge we took a track passing Garn ddyrys farm and leading to a road where we found an imitation blue plaque for the farm attached to a stone. Crossing the road we took a footpath which contoured around the north of the Blorenge. This wide grassy track degenerated to a narrow rough path as we passed close to woodland. Large machinery was clearing some of the trees and loading huge tree trunks onto the back of trailers. Lunch was taken on a comfortable slope above the wood with the sun beating on our backs for the first time this year. Continuing we could see Sugarloaf and later Skirrid in the distance. After Pen y Craig farm we followed a stream downhill through Glebe wood to the Brecon and Monmouth canal at Llanfoist. A sign at the bottom stated ‘access to the towpath is only through the tunnel’. 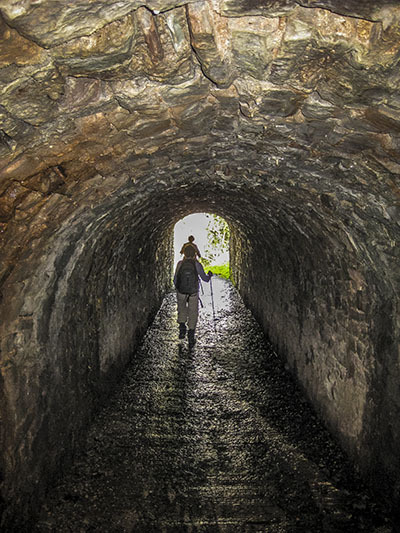 The sound of thundering water passing through this tunnel was somewhat off putting, especially as the ground looked really wet. Entering we found the tunnel was a good height and totally safe, the water flowing in a separate channel. Emerging we could see Abergavenny ahead of us. Now we were to take a gentle stroll along the canal back to Govilon to complete the walk. But we were disappointed to find that the towpath was closed for embankment repair between Llanfoist and Govilon. Luckily the tramway was nearby so we were able to follow that back to Govilon. Once again we spotted birds of prey soaring above us and passed a wharf with a number of boats.